If you are interested to buy an unlocked iPhone 3G, you may want to try Hong Hong. 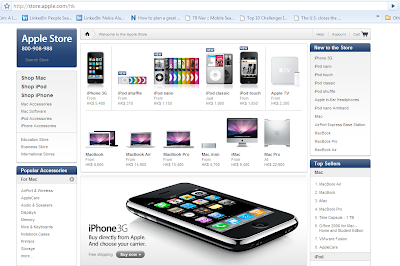 Apple is selling the iPhone 3G on its Apple Store Web site in Hong Kong, promising the phones can be activated with any wireless carrier. The Apple Store in Hong Kong is selling the 8G-byte and 16G-byte iPhone 3G models for HK$5,400 (US$695) and HK$6,200, respectively, with free shipping. The store advertises the compatibility of the phones with any carrier, saying, "Apple 3G, Buy directly from Apple and choose your carrier." Apple did not offer an explanation for why it started selling unlocked iPhones in Hong Kong, or indicate whether such sales will be offered in other markets. Currently the offer is only open for users residing in Hong Kong. If you have friends who are living in Hong Kong with a legit address, I m sure you can use their address to have the iPhone shipped free of charge and have it picked up later.